Keep hair nourished, long and excitingly frangrant. 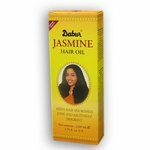 Dabur Jasmine Hair oil nourishes hair, while providing a rich sikly feel and a delightful fragrance of Jasmine flowers. For best result, apply 1 to 2 teaspoons of Dabur Jasmine Hair Oil into the hair and leave for a considerable time (ideally at least 1 hour). Then apply a good shampoo such as Dabur Vatika Henna Cream Conditioning Shampoo. Massage the shampoo well into the hair and scalp. Rinse. For best results, apply Dabur Jasmine Hair Oil three times a week. Paraffinum Liquidum, Cotton seed oil, Seasme oil, t-butyl hydroquinone (anti-oxidant), fragrance.